SIGN UP USING THE FORM BELOW OR CALL 360-681-0117. 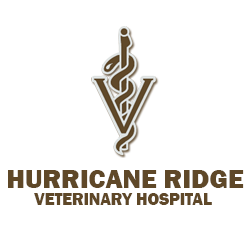 The veterinarians at Hurricane Ridge Veterinary Hospital are extensively trained and experienced to offer a wide variety of services from routine care to advanced diagnostic and surgical procedures in house. Emergency services: Emergencies can occur at any time. Hurricane Ridge Veterinary Hospital is ready to assist you with your pet's emergency during normal business hours and after hours. We offer a veterinarian on call for established clients. Dr. Toni Jensen and Dr. Joshua Borg are available after hours for emergencies (Their availability cannot be guaranteed). Please call the clinic number 360-681-0117 for instructions on how to reach us. In the event that both doctors are unavailable you will be referred to Animal Emergency and Trauma Center, 360-697-7771 or VCA Central Kitsap, 360-692-6162. Preventative care and vaccines/ titers: Prevention of and early diagnosis of disease is critical to ensuring your pet lives a long and healthy life. Even with the technological advancements in medicine, a comprehensive physical exam is still a doctor's best diagnostic tool. During an exam, the doctor will look at your pet's eyes, ears, nose and teeth. They will listen to their heart and lungs and palpate the abdomen for any abnormalities. Peripheral lymph nodes, skin and hair coat will be examined. The doctor will palpate your pet's joints and look for signs of discomfort or swelling. Vaccinations are given based on your pet's risk and lifestyle. As an alternative to vaccination, vaccine titers can be performed. Internal medicine and blood testing: Dr. Jensen has extensive continuing education in internal medicine. She is experienced in management of diabetes, cushing's disease, addison's disease, liver and kidney disease. She has an interest in feline geriatric medicine and management of concurrent disease processes. Hurricane Ridge Veterinary Hospital has a full in house laboratory for quick diagnosis and management of disease. For more specialized testing, an outside lab is used. Referral to a board certified internal medicine specialist can be arranged when appropriate. In house pharmacy: Hurricane Ridge Veterinary Hospital has a full in house pharmacy. For animals that are difficult to medicate, we offer an online compounding pharmacy. Your pets medication can be formulated in a liquid, chew or transdermal medication. We also have the safest and most effective flea and tick preventative medications. Spay and neuter: Having your pet spayed or neutered is the best way to prevent overpopulation and a variety of medical conditions. Altered animals are shown to live longer lives. There are pros and cons of when to spay/ neuter your pet, our doctors can discuss these with you and formulate a plan that makes sense for your specific pet. Orthopedic surgeries and advanced soft tissue surgeries: Dr. Jensen and Dr. Borg our both experienced surgeons. Hurricane Ridge Veterinary Hospital can perform tumor removals, bladder surgery, intestinal surgery, cesarean sections and eye surgery. For more advanced procedures, such as cranial cruciate repairs, luxating patella, pelvic fractures, liver resections, laryngeal paralysis and hernia repairs, we have a BOARD CERTIFIED SURGEON that comes to the hospital. Dermatology and ear disease: Sequim and the Olympic Peninsula is one of the most beautiful places to live, unfortunately it is a also a high allergen area. The doctors at the clinic can discuss with you environmental, seasonal and food allergies. Dental cleanings and oral surgery: Dr. Jensen and Dr. Borg have performed thousands of dental procedures. Hurricane Ridge Veterinary Hospital has a state of the art dental suite. Each patient receives blood work prior to anesthesia. While under anesthesia x-rays are taken of your pet's teeth to evaluate disease under the gum line. If extractions are necessary, a local pain block is applied, an incision is made into the gingiva, the affected tooth is sectioned and removed, and the gingiva is sutured closed. The remaining teeth are cleaned and polished. While your pet is under anesthesia, they have monitors to evaluate blood pressure, EKG, heart rate, oxygen saturation and temperature. An IV catheter is placed and fluids are given to provide cardiovascular support. Hurricane Ridge Veterinary Hospital uses a multimodal pain management plan to make sure your pet wakes up comfortable and remains comfortable during recovery. Ultrasound services: Hurricane Ridge Veterinary Hospital has a modern ultrasound machine with the most current technological advances. Ultrasound can give clear images of abdominal organs, such as the kidneys, liver , spleen and bladder. It is a non-invasive technique to diagnose disease processes, such as tumors, inflammatory conditions, and other abnormalities. It can also be used in an emergency to look for internal bleeding in a matter of seconds. Dr. Jensen and Dr. Borg have both undergone extensive training in ultrasound. For more advanced or complicated cases, Dr. John Stowater, a boarded radiologist, comes to the practice and performs a thorough evaluation in house. Euthanasia and hospice care: Making the decision to say goodbye to a beloved animal is very difficult. Our veterinarians can help you through this difficult process. House call euthanasia is available for established clients. Our Regular Schedule- After hours doctor on call for established clients only.